Vintage good looks and three-wheeled goodness are some of the most defining aspects of a Morgan. 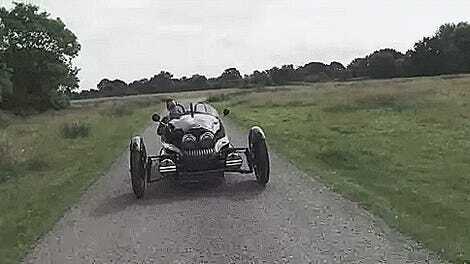 And Morgan delighted us further by making an all-electric model, the EV3. But there was one problem: it was for adults only. Not anymore! Morgan said that the grown-up EV3 could hit 100 mph and do zero to 60 in eight seconds. The EV3 Junior, made especially with kids in mind, cannot do anything close to that, thankfully. What it can do is travel at up to speeds of 16 KPH (nearly 10 MPH) with a range of 10 miles, depending on how aggressively you drive it. Charging takes four hours. You can get it standard with red, green or ivory paint, and a black or tan leather interior. But, if you’re pickier than that, you can also choose from Morgan’s 40,000 other paint colors, you’ll just have to pay extra. People over the age of six shouldn’t drive this car as they probably will not fit. But like I always say, age is just a number. The EV3 Junior, like its full-grown version, also has a wooden dashboard, hand-stitched leather interior and a carbon fiber body. It is completely handmade. Does that make it sound like it’s expensive? You bet your bottom dollar it is! The EV3 Junior costs £6,662.50, or approximately $8,250 (£7,995 or about $9,900 with tax). If you love your kid more than you love that amount of money, you can buy it from the Morgan shop in the UK, Morgan dealerships or the Morgan online store.